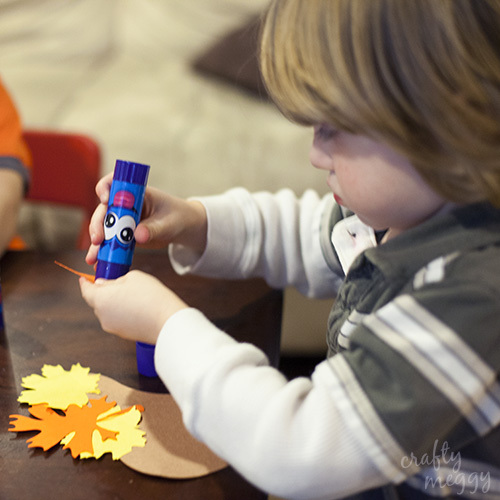 I have a fun and easy kids craft to share with you today. 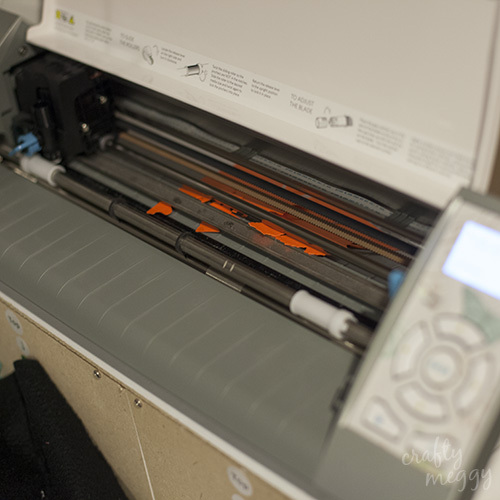 It is really so easy and it only took about 30 minutes, including prep time! I adjusted the settings and went to a lower speed, but it still had problems. And the blade is NEW!! I got it a few weeks ago and I haven’t been using it THAT much, at least I don’t think I have…. Now that I think about it, my mats are pretty well used and a few months old. That could possibly be the problem. I don’t know if you can tell, but in the picture above you can see the construction paper is taped to the mat. 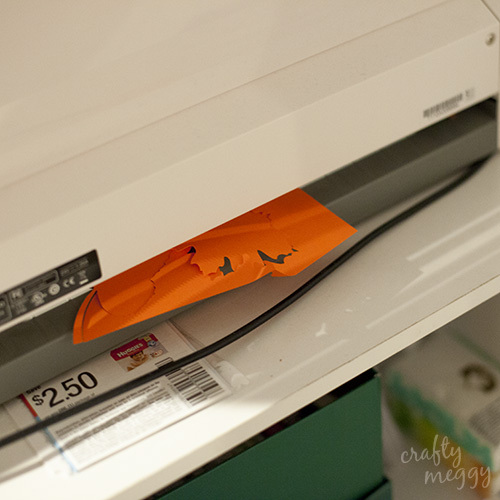 If I don’t do that the paper comes off, and it’s very frustrating when that happens. I guess it’s time to go back to my Sticky Tutorial post and freshen up my mats! 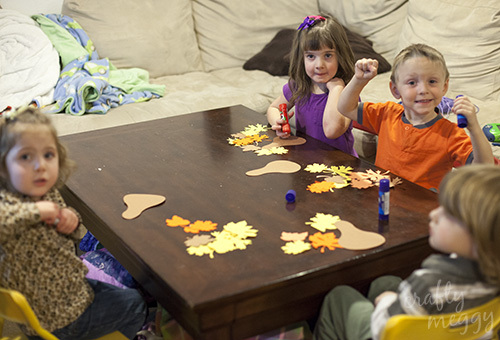 Anyway, I was able to cut out enough leaves for the kids to use. I babysit a little boy my sons age during the day 3 days a week and sometimes some girls from down the street come over to play as well, so I thought it would be fun to do a craft with all of them. And it really was fun. 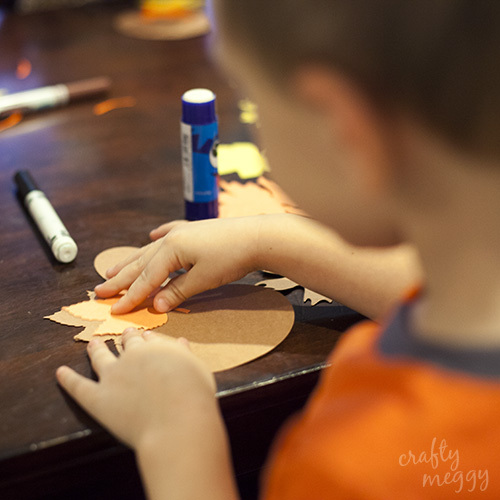 If you know me at all, you know that I have a hard time doing crafts with my kids. It’s just too stressful. 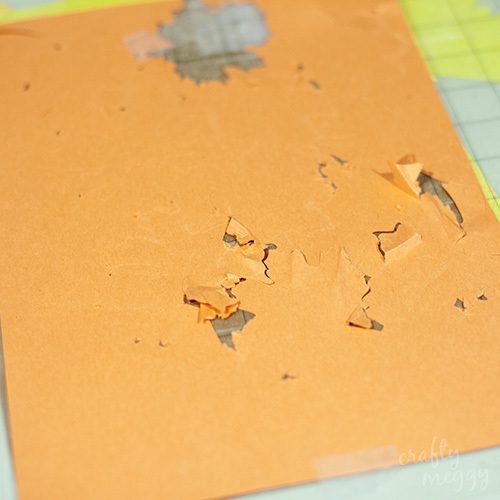 I have a hard time letting go and having them do it their way:) SO, I usually avoid it, but since I only had one of my kiddos doing this craft I thought we would be safe…. and we were! It was actually a LOT of fun! They each had their own glue sticks, so I think that helped. His friend from down the street glued all her leaves to the back of the turkey so you couldn’t see them. Yes, it drove me crazy and I tried to help her fix it, but I gave up and let her do it her way. I love the serious concentration going on here! 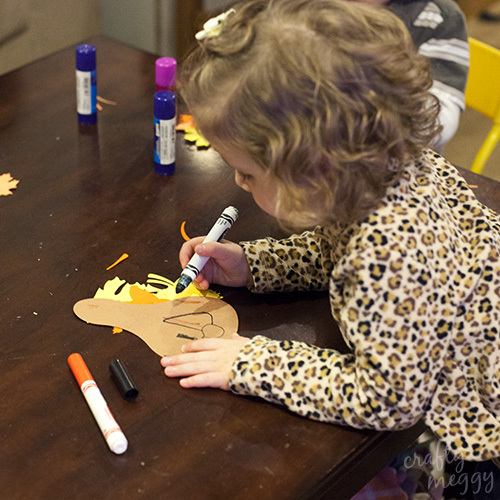 Little D was really good about using the glue and putting the leaves around the turkeys head. I just had them draw faces on the front of their turkey with markers. I love D’s masterpiece! Tini was SO proud of his turkey! 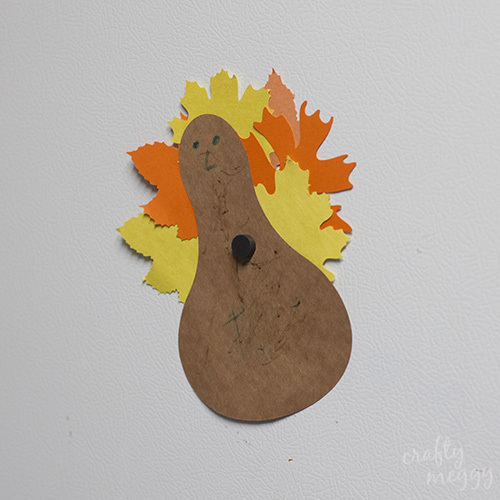 And here’s Tinian’s masterpiece of a turkey hanging in it’s rightful spot on the fridge. I love it! So, I CAN do crafts with kids, as long as it’s other peoples kids! haha… It was a lot of fun and actually my 7 year old came home and saw the one that Tinian and D made and really wanted to make one too. I told him maybe another day so we shall see how long that will hold him off for. Thanks for stopping by!! I hope you’re having a great day! 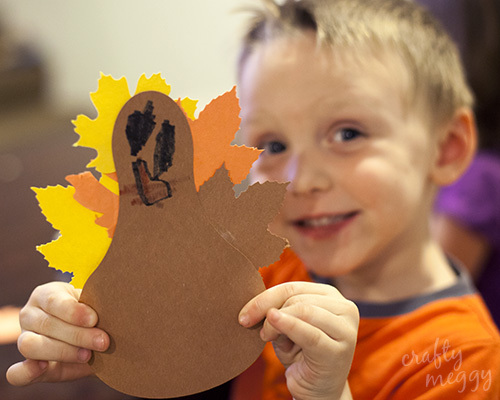 What Turkey crafts are you working on? Cute stuff and cute kids! Love the picture of G 🙂 and their proud faces with their projects! Oh, Megs,you are such a saint. I’d be like, “I already have another kid besides mine here today. I’ll see you another day.” Not only do you let them play, but you give them crafts to do??? Saint, saint, saint! Yeah I guess I am a saint…. 😉 I just wanted the time to pass quickly and this really was less stressful than having them play! Hi Megan! Just popping by to say hello from the Idaho Bloggers Guild. Cute turkey. 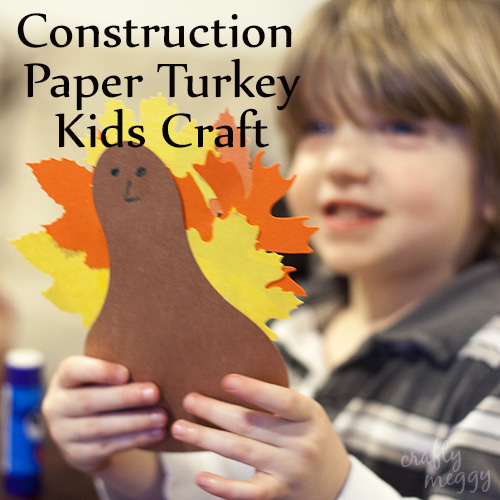 🙂 We’re always looking for a fun kid craft. Those are so cute! (And I have to add…I just won a Silhouette and I’m still waiting on it to be delivered, so I was even a little jealous and a little excited about your torn up leaves!) 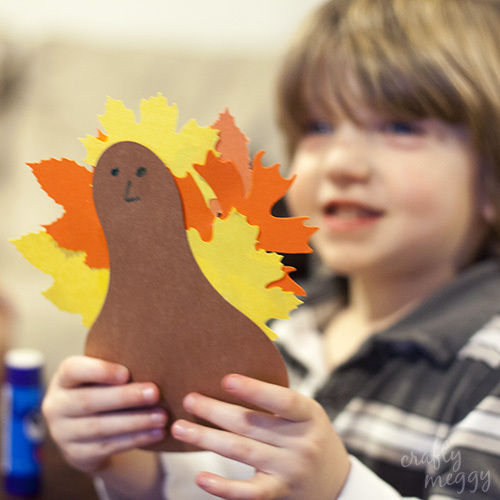 I don’t think I’d do very well doing crafts with small children, either–but the little turkeys turned out great! Pinning! Yay and congrats on winning a Silhouette!! You will LOVE it!! I can’t wait to see all the crafts you make with it! :) Thanks for stopping by! I don’t know if I’ll ever be able to let go of everything!! lol Thanks for stopping by!